Cleaning Whiteboards is easy with these 4 tips. 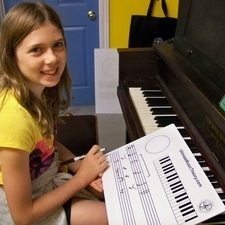 You finally bought your Ultimate Music Theory Whiteboards and can’t imagine what lessons were like before them. But now your Whiteboard is not as white as it used to be. 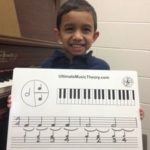 The Ultimate Music Theory Whiteboards are a unique and exciting addition to any Music Studio and to every Theory Lesson. One side of the Whiteboard is blank. The other side has a circle, a keyboard and two empty staves. Purchase a “Marker Board Cleaner” Spray. This is a spray designed specifically to clean a Dry-Erase Whiteboard. Found in most “Office Supply” Stores, this spray makes cleaning whiteboards a snap. Put some hand sanitizer on a piece of paper towel and wipe the Whiteboard down. Then use a water dampened piece of paper towel to wipe the residue off and then dry the Whiteboard off thoroughly with a soft cloth. Spray the Whiteboard with eye glass lens cleaner or with iPad/iPhone cleaner. Clean with a soft cloth. The life of a Dry-Erase Eraser is usually 1 to 2 years. If you find that your Eraser is not erasing cleanly, wash it thoroughly in warm soapy water and then rinse it under a warm running faucet until all traces of the soap are gone. Pat it to remove excess moisture and then let it air dry for a couple of days before using it. 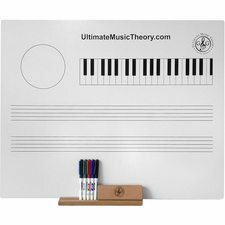 The Small Whiteboard fits perfectly in the Ultimate Music Theory Tote Bag and can be used by students at home when completing their Theory AND at the lesson for games and activities. The Student Whiteboard comes with a Dry-Erase Marker and a small Dry-Erase Eraser. Replacement Dry-Erase Markers and Dry-Erase Erasers are available at most Dollar Stores and at the Office Supply Store. Do not use a “Permanent” Marker on your Whiteboard – you must only use markers that are specifically made for Dry-Erase Whiteboards. The Large Whiteboard fits neatly into a stand and is light enough to be kept on top of your piano, desk or bookshelf. The Teacher Whiteboard comes with 5 different colored Dry-Erase Markers and a large Dry-Erase Eraser. We are often asked why we did not make these boards magnetic. First of all, we wanted to ensure a top quality product at an accessible price, and adding the magnetic component to the Whiteboard would have tripled the cost. Secondly, we wanted our Whiteboard to be light enough for even the youngest of students to use with ease. Again, adding the magnetic component would have tripled the weight. 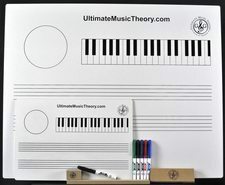 Finally, there are simply so many uses for the Ultimate Music Theory Whiteboard, it would be impossible to create all the magnetic pieces needed to play all the games and activities. It is much easier to just use a Dry-Erase Markers. One large (24 x 30) and one small (11 x 16) two-sided Whiteboards. EASY TO CLEAN - Cleaning Whiteboards using the 4 Easy Tips! If you have a tip for Cleaning Whiteboards, please share it below. A small section of paper towel with one drop of Sunlight dish detergent to clean followed by a lightly dampened paper towel to wipe off and a dry paper towel to shine dry and VOILA! thank you sweetheart for the info. you have been so helpful! 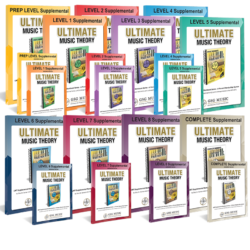 Do you have any tips for transposing for different band instruments. I get all mixed up about going up or down ie. clarinet music to concert pitch and vice versa. I enjoy reading all your little tips.